Contribute for a good cause and earn priceless Punya karma (Good Deeds) !! Someone might have offered you a helping hand when you were down anytime in your life, volunteering gives you the opportunity to pay that favor forward. Contributing for a good cause gives you HAPPINESS that can’t be bought by any amount of money!! I could not stop writing my recent experience volunteering for a great organization and supporting their very nice products called “Chaakri” Khakhara (Wheat Crisps), Chaakri signifies ‘seva’ and ‘service’ in the Hindi language. All the great products for Chaakri are made by underprivileged women from a rural part of India. “SaNiSa” (Shramik Naari Sangh), this organization thrives to integrate the talent of contemporary and less-privileged women to build an ‘inclusive’ society. “Privileged are those who support the less privileged” is their tagline, you can find more details on their website www.sanisa.org This organization help creating employment for needy women through the skill identification, motivation, capacity building, and innovation. It helps to create lots of employment opportunities for underprivileged women in a rural part of India. 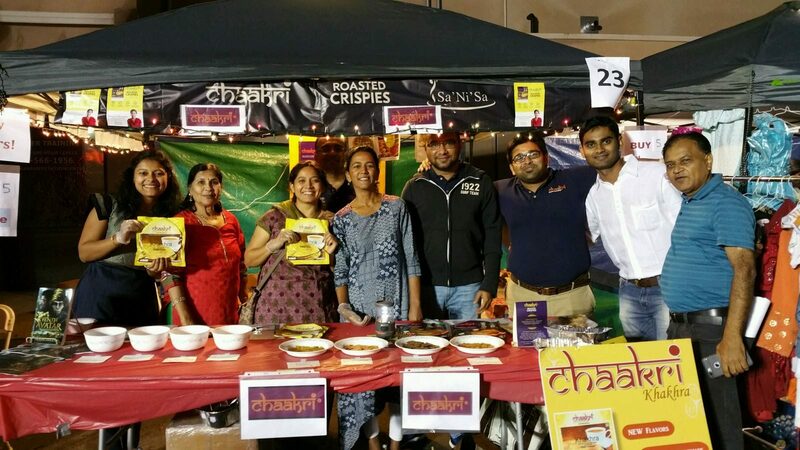 We had very nice and small booth of Chaakri Khakhara at Sri Mandir, San Diego Diwali Mela where couple to few thousand people visit every year on this event. We started couple hours before the event, set up a booth in about an hour time with the help of a fully energized team of volunteers. We had a free sample of Chaakari Khakhara for people to try, taste and feel the difference in quality. People who tasted this didn’t leave stall without having a packet in their hand! It was a great feeling and happiness, not just for volunteers but also for the buyers as they both knew that both are contributing something to a great cause and earning “Punya Karma”!! In just 5 hours of time spam, we sold 110kg khakhra, that proves the quality and interest. A great event ended with lots of happiness, positivity, energy to empower ourselves to help as much as by whatever way you can! With busy lives, it can be hard to find time to volunteer but I must say, time and effort you spend volunteering for a good cause gives you priceless happiness that you cannot get it from anywhere. Volunteering and helping others can help keep you mentally stimulated, and provide a sense of purpose !! What I feel best out of my recent volunteering experience is even helping out with the smallest tasks can make a real difference to the lives of people, and organizations in need. I would like to thank Amee-Pritesh and “SaNiSa” organization for giving us an opportunity to volunteer and be a part of this big cause and to earn new Punya Karma (Good Deeds) “PunyanuBandhi Punya” ! !